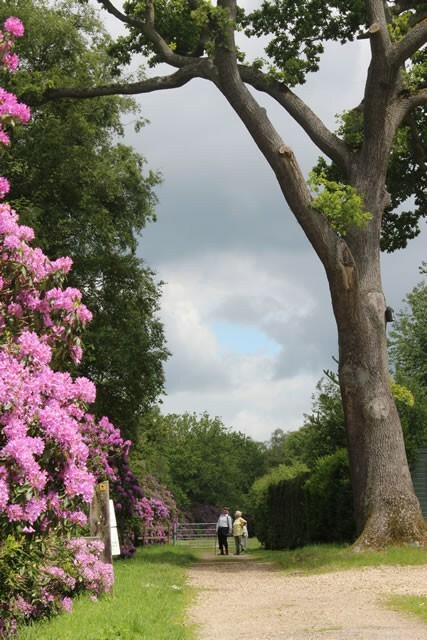 Woodhall Spa is a beautiful inland resort with an Edwardian character, set amidst magnificent pine woods. Regarded as one of Lincolnshire's most attractive villages, Woodhall Spa is famous for its peaceful and relaxing atmosphere, and with many fine hotels and guest houses it is the perfect location for a short break or holiday. The village has a variety of attractions including two top class golf courses, the unique 'Kinema in the Woods', Cottage Museum, Jubilee Park outdoor heated swimming pool and several aviation heritage sites associated with 617 Squadron (the Dambusters). The community website aims to provide residents and potential visitors with detailed information on local business, amenities, tourist attractions, and events in the village and surrounding area. There are more than 100 pages of information and photographs, so please use the menu or the search facility on the right of this page to explore the site and learn more about Woodhall Spa. Woodhall Spa vous accueille dans sa belle station thermale où l’ambiance respire le style et l’élégance des premières années du vingtième siècle. Entouré de forêts de pins magnifiques et considéré comme un des plus beaux lieux de séjour du Lincolnshire, Woodhall Spa est réputé pour son atmosphère de calme et de détente. Avec ses beaux hôtels historiques, ses chambres d’hôte accueillantes et ses charmantes pensions, c’est un endroit parfait pour profiter d’un weekend relaxant ou d’un séjour peut-être un peu plus étendu. Le village vous invite à participer à de diverses activités de loisirs – ses terrains de golf, par exemple; son “Kinema-in-the-Woods”; son musée; son beau jardin public avec sa piscine plein air – mais chauffée car il le faut, bien sûr! – et tous les endroits historiques associés à son glorieux patrimoine aéronautique, un passé qui est surtout lié, entre autres, à l’escadron 617 – “Les Dambusters”, si célèbre grâce à ses activités héroïques pendant la 2ème Guerre Mondiale. Ce site vise à fournir aux riverains aussi bien qu’aux visiteurs éventuels des renseignements détaillés sur les commerces locaux, les agréments et les installations touristiques et également sur les événements prévus au cours de l’année dans le village et sa commune environnante. Il y a plus de 100 pages d’information avec photos, donc amusez-vous et renseignez-vous en vous servant du menu et des liens pour explorer le site! Can anyone recommend a local chiropodist? Time to take down the village Christmas Trees. If anyone is available to help, we meet up in the Co-op car park Sunday 6th Jan at 8:00 am. Many thanks in advance. If you have a uPVC door and the handles are beginning to become loose (please see video below), then please change them immediately before it creates further issues. By continually forcing the handle up to engage the locking mechanism you are shortening the life of the gearbox. Changing the handles on a uPVC door is really easy to do as you only need to undo two screws. I am sure you can get replacement handles from Goodwins, and if they are not in stock, then Ash will be able to order them. uPVC handles cost around £25-50 depending on the make and model. A uPVC gearbox can cost anything from £65 - £110. The labour rate for a competitive locksmith can vary from £60-85 per hour but will be significantly more if the issues require resolving at 2 am. So, by spending £25 now and change the loose uPVC handles you will avoid a £150 - £200 bill. Its been an incredible season for us and we hope that the weather is as kind in 2019 and that both of our grant applications come through. We have long needed to refurbish the pool building and know how supportive the local community is that we include a gym in this refurbishment. Since becoming a Charity in 2014, the Park has gone from strength to strength, but to really secure its future long term we need an all year round non weather dependent income stream. Please remember the Park receives no government or council funding, everything we do is self financing and mainly down to our truly wonderful staff, volunteers and trustees. Without these people and the thousands of unpaid hours that have gone into Jubilee Park, the Park certainly wouldn't be the same. We are very proud of how the park is looking and have a number of plans to improve areas of the park over the coming year. This isn't possible without the wonderful support of the users. Over 77,000 people visited the Outdoor pools in 2018, almost 7,000 people came and stayed on our caravan and camping site in 2018 and countless people came and enjoyed the Park, its beautiful gardens and children's play park. I went into a shop in Hebden Bridge today - Two Tone Comics. It has been there for 15 years, has been part of the community, and has been through the good times and bad (including 2 horrendous town-wide floods). I went in for a present, and the owner's advice (not sure what I'm buying, as it's specialist). They sell graphic novels, comics and collectable stuff. They are wonderful with their customers, and the shop is a treasure trove for people into this stuff. The owner, Mandy, spent time and advised me on what would be a good choice, by what I told her my son liked reading. We chatted, and as I was leaving she said "Thank you for coming in and buying from us. You are my first customer of the day". It was 2pm! I went back and chatted more. "I'm not sure what has happened this year," she said "Everything has changed. We've not had the usual Christmas rush". We then talked about how people were going in browsing, then taking photos and leaving and buying online. "It's really common. Last week, next door (a record shop) kicked someone out for doing that". I spoke to some other shops in the town and they said the same happens to them. So what is it, that makes people feel they can use a shop as a 'viewing room' for Amazon just to save a quid or 2? If you do this, one day you will turn up and that shop won't be there. And then you are stuck with a massive corporation to buy your specialist stuff. One who will not contribute one penny to your local economy. And to be honest, they really don't care about you or your town - it's all about the money. And you won't get that advice like I got yesterday from online. And if you think about the contribution to your local economy AND your social economy that a small shop like this makes,(ie what makes your town a good place to be) you know what to do. Just buy local. It's as easy as that.